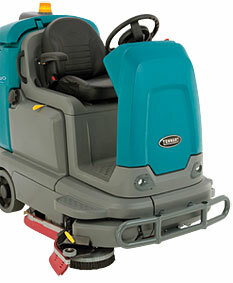 Experience the power of a heavy-duty ride-on scrubber without sacrificing maneveurability. The T12 offers a 28% wider scrub path and edge-to-edge cleaning when using the optional scrubbing side-brush. Clean effectively, save money, increase safety and reduce environmental impact with optional chemical-free ec-H2O™ Technology when compared to daily floor-cleaning chemicals and methods. Clean floors from edge-to-edge with optional scrubbing side-brush. Save time and money in routine maintenance activity with easy-to-identify, yellow maintenance touch points. Keep cost of ownership low and ensure maximum uptime with worry-free operation, durable construction, and ease of maintenance. ​Engineered to be easy to operate and maintain, providing worry-free operation. Enhanced user experience with intuitive controls, excellent visibility and enhanced ergonomics, easily accommodating operators of different heights. Operate easily while maneuvering with cleaning controls fixed in the center of the steering wheel. The operator's attention is able to face forward with cleaning controls to the right of the steering wheel. Simplify operator training with controls that enable the scrubbing systems to be activated with a single large green button. Increase ease of use with the new Insta-Fit™ Brush Adapter, which reduces the time and effort required to replace or change disk brushes. Maintain sparkling floors and remove the guess work from brush maintenance with a built in brush wear indicator. Innovative features and substantial power provide the ultimate in cleaning satisfaction. Tackle tough cleaning jobs with impressive main scrubhead down-pressure of up to 114 kg (disk brush configuration). Achieve more versatile cleaning and reach more spaces with a smaller, compact footprint and tight turn radius. Reduce risk of slip and fall accidents with a high-performance genuine Tennant squeegee and a powerful vacuum system that delivers a virtually dry floor. ​Save time spent cleaning by utilising innovative product features and cleaning technologies. Scrub up to three times longer with a single tank of water. Get more cleaning done with a 28% wider scrub path when using the scrubbing side-brush. Provide convenient off-machine spot-cleaning or spill recovery with the optional integrated vacuum wand. ​Ensure peace of mind with operator safety and promote healthy cleaning environments. Reduce risk of slip and fall accidents with ec-H2O™, certified by NFSI (National Floor Safety Institute) for delivering high-traction floor surface. Reduce fatigue and increase operator safety with a large operator compartment and easy ingress and egress from either side of the machine. Clean in noise sensitive areas with a low dBa level that allows for anytime cleaning. Protect operators by shielding them from falling objects directly overhead. ​Durability, reliability and exclusive technology results in low cost to own and improves the bottom line. Save money by reducing the need to purchase chemicals. Save time on chemical filling, draining and employee chemical-handling training. Reduce maintenance cost through use of a sealed, controlled-speed, brushless 1.2 HP (.89 kW) AC propel motor. Achieve consistent, cost-effective cleaning with QA Controls® by locking in the ideal machine settings. Protect the front and rear of the machine from impact damage with optional heavy duty front bumper and the rear squeegee protection kit. For more information, fill out the form below and a local sales representative will promptly contact you.